He might be the hardest working guy in Hollywood. Host-comedian-network exec Nick Cannon gets candid about his – and Kevin Hart’s – success, explains why he isn’t impressed with either presidential candidate, and offers Larry his perspective on life after death. Plus, the multi-hyphenate opens up about fatherhood and his split from Mariah. 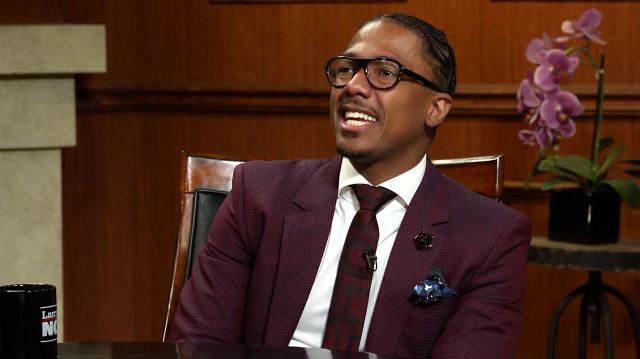 Nick Cannon reveals how he became the Renaissance man that he is today and explains that he never thought neither him, nor his close friend Kevin Hart, would be the success stories they are today. He speaks on the beginning of his career, when they both just wanted to be in the comedy clubs. Cannon doesn’t hold back when he reveals his views on the 2016 presidential candidates. He explains that he believes neither candidate is truly concerned with his community or Black Lives Matter. He stresses the importance of local politics, including knowing your City Council, and declares himself apathetic to the “pageantry” of presidential politics. Cannon also talks about why he isn’t scared to die, just as long as he leaves behind a good story. Cannon discusses his spirituality, God, and just how quantum physics comes into play with his belief in an afterlife. Cannon also reveals the reality of his life as a father of twins and his not-so-salacious split from pop diva Mariah Carey. "I don't know why the hashtag, and sometimes even the movement, is taken in the wrong context. It's really a cry for help, ultimately.” — Nick Cannon on the Black Lives Matter movement. "I don't think Trump nor Hillary represents our community, I mean as we both know that the President is not constitutionally responsible for communitiesand that's where the issue is. The issue fall, whether we want to talk about racism or capitalism, these are the problems." — Nick Cannon why he’s not voting for either candidate. "I believe it was designed for her to be our next president, they just put Trump up there to be like we gotta find somebody worse than Hillary and we'll get the guy who's the host of the apprentice." — Nick Cannon on Hillary Clinton. "Energy! Energy never dies, we all gotta go somewhere. And I truly believe that our spirit is everlasting... I feel like our energy was birthed by a greater entity and I definitely, you know I come from a long line of ministers and pastors and so not to be too religious, but I'm extremely spiritual in that sense to where I believe I hear the voice of God daily that guides me." — Nick Cannon on why he’s not afraid of death. "You're nothing without your stories, and that's how you leave your legacy and that's why I believe, you know, the community is so important to me, because I want to make sure that my presence is felt even when I'm no longer here. So whether that financially, whether that's politically, whatever I can do. That's how I feel people live eternally, because of what they did when they were here." — Nick Cannon on what he wants his legacy to be. "We're taking the steps, the voices are being heard. Again, I put the charge on a lot of the people that are in the position, not just the studio heads, but people like myself who are producers, who have the ability to create content. We have to step up and demand diversity, and you know, that's nothing new, but as long as we do it, we're the ones, we're the voice, we're the storytellers." — Nick Cannon on trying to bring diversity to entertainment. "We all love Mariah, and she's outstanding, and you know how some of these things, they don't work out in the way you thought they were gonna work out and it was probably best for our family to remain a family, first and foremost." — Nick Cannon on his divorce from Mariah Carey. "They're wrong the majority of the time! But, you know, it's sad because perception is reality in our world and all you need is a big headline, just because it's loud doesn't mean it's right. But you get past it, that's the beauty of this ADD generation and all of this constant information being thrown at us, they forget about it the next day." — Nick Cannon on tabloids. "Take no one's advice." — Nick Cannon of the best advice he’s ever been given. "As much as I attempt to live a fearless life, it's scary to know that that can happen to you.... I believe this has been going on for years, it's just the fact that now we have cameras and media to display it, and the fact that sometimes there's no repercussions or you know actual criminal repercussions in a sense from our criminal justice system makes it even more scary 'cause man, if they feel like they can, even once we've shown you the video and there's still no indictment." — Nick Cannon on police brutality. "I actually got on my soapbox recently and said I'm tired of seeing slave movies, I feel like that's something that's constantly perpetuated and pushed forward and it's like ok, we get it. You know, to me personally, I like to receive my history from books, I don't really want to see actors acting it out and studios profiting off, you know, the bloodshed of slavery." — Nick Cannon on why he’s against slave movies. "We love 'Game of Thrones,' we love 300, why not, there are some great African warriors of our ancestors from Musa to Nefertiti, these things can be told in a way and can bring as much attention and a huge audience as any of these other comic book films and these epics that are being portrayed by characters that aren't really represented from our community, so that's my goal. I'm gonna make a 200 million dollar African epic and everybody's gonna love it." — Nick Cannon on his goal of creating an African epic.